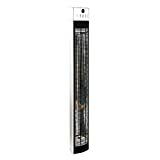 Using just 2000W of power this advanced vertically wall mounted heater from Optima Heaters boasts up to 14sqm of heat distribution. It also comes with a handy remote control and a carbon fibre heating element which should last you over 8,000 hours. If that’s not enough it has an ingress protection rating of IP55 making it suitable for indoor or outdoor use, whatever the weather! We’ve had nothing but positive things to say about Optima Heaters and the Edge is no exception. It comes with all the bells and whistles of the blade like built-in PIR sensors, remote control activation etc, but has a reduced maximum heating area coverage (14sqm vs 22sqm). It’s also a bit more expensive than the blade, but offers a unique vertically mounted installation method for those lacking the space to hang a heater either horizontally, from the ceiling or free standing. The Optima Heaters Edge consumes just 2kW but offers up to 14sqm of heat coverage. This is better than average, with most 2kW heaters providing 8-15sqm – the exception, of course, being the Veito S2000 which offers 25sqm of heat but you’ll be paying upwards of £60 more for the privilege. Suitable for both commercial and home users with a wide heating angle of 130°. The entire range of Optima Heaters use advanced carbon fibre elements rather than a traditional halogen bulb, this provides us with an extended element life of over 8,000-hours of instant radiative heat. With no adjustable power settings, you get what you are given with this heater – Which is why this is very much a commercial heater rather than one for the home user. It does have an economy mode which activates the PIR sensor. This will turn off the heater when no movement has been detected for 4 minutes. This saves the hassle and the added cost of installing a timer or push-button switch in your beer garden! Each edge heater comes with a 1-metre power cable and 3-pin British standard plug. The power is rated at 220-240v, 50/60Hz. Built from anodised aluminium and finished in brushed metal, this heater means business. With low glare carbon elements, your customers will watch in awe as they feel the heat radiating from this stunning heater. Supplied with – PIR sensor economy mode, 8,000+ hour element life, remote control, wall mounting brackets, off-timer & overheat protection. Topped off with a fantastic 2-year warranty. The Optima Edge is rated IP55 – and will work in all weather conditions. If you need to heat your pub, club, restaurant or any outdoor (or indoor) area then these heaters might just be right for you. Definitely more of a commercial heater than a home heater unless you specifically need a vertically mounted wall patio heater. Very affordable as far as electric heating goes. A fantastic heater at an affordable price. Highly recommended! If you purchase this heater directly from Optima Heaters you’ll be spending a bit more than you have to. With the official site pricing this at £249.00 + £12 shipping. If you purchase this heater via Amazon you’ll be saving £54 (at a purchase price of £195.00 + £12 shipping)! Another outstanding all around heater from Optima Heater. We genuinely hope they come out with some patio heater tables in the near future.